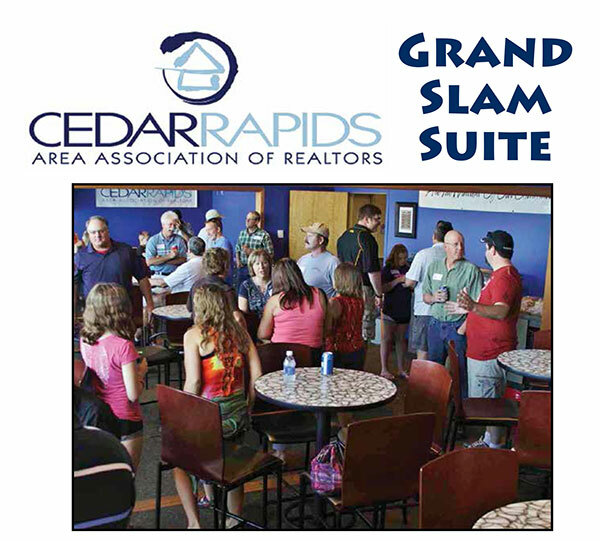 Located within the suite level, the Cedar Rapids Area Association of Realtors Grand Slam Suite can host a group of up to 135 people. The Grand Slam Suite is completely enclosed and climate-controlled--perfect for cooler Spring days, or warmer Summer days. There is additional seating located outside the suite for those who prefer it. The minimum to rent two rooms of the Grand Slam Suite is 30 people (seats 30 to 60), the minimum to rent three rooms of the suite is 50 people (seats 50 to 100), and the minimum to rent all four rooms is 75 people (seats 75 to 135). There are two packages to choose from in the CRAAR Grand Slam Suite area. The all you can eat and drink package is $40 per person, and includes your ticket to game and unlimited food and beverage from the time the gates open (1 hour prior to start of game) until the end of the game. The alternative package is a ticket-only package for $25 per person, and includes usage of the suite and your ticket to the game. Midwest League All-Star: Juicy hamburgers, hot dogs, and brats, served with THREE sides of your choice (see below), and your favorite cans of soda, beer*, and bottled water. The Bullpen: Freshly grilled chicken breast sandwiches and our finest all-beef jumbo hot dogs, served with THREE sides of your choice (see below), and your favorite soda, beer*, and bottled water. *Veggie Burgers can be added to your menu at no additional cost. Please call at least 72 hours in advance of your date to add them. Please select TWO domestic beers that you will have for your event. Contact Andrea Brommelkamp at (319) 896-7603 or email her at andrea@kernels.com if you are interested in booking the CRAAR Grand Slam Suite for the upcoming season!